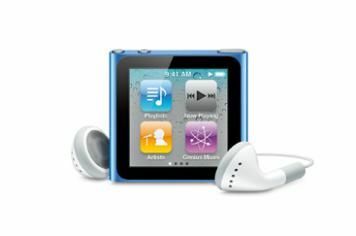 Apple iPod Nano (4G) review | What Hi-Fi? You can see why Apple has gone for a new-look nano. In theory, what isn't there to like about a scaled-down version of the iPod Touch? In the flesh, and in any one of seven different colours, the Nano looks cool. It's 46 per cent smaller and 42 per cent lighter than its predecessor – not that the previous generation was a handful… Think of it as a slightly larger iPod Shuffle with a touchscreen – it even has a clip on the rear. A three-hour charge should be enough to guarantee around 24 hours of playback. The 1.5in touchscreen with its 240x240 pixel display looks crisp when you're ogling album art and responds swiftly enough, although all that finger-swiping and tapping on such a small surface soon covers it in smears. Overall, it's not as easy to get to grips with as the click-wheel design on the previous model – the volume and power buttons located on the side of the player are a bit finicky and not really made with chunky hands and fingers in mind. You still have a built-in FM radio (complete with a 15-second buffer for pausing a rewinding), pedometer, and the ability to listen to Genius Mixes created by the player. But, shrinking the Nano to this degree has meant a few functions have fallen by the wayside. Gone is the video camera – and with it, video playback. If you want these or the ability to access games and apps, you've got to stump up the cash for an iPod Touch. And that's another mark against the Nano: spend an extra £30 and you'll be able to land an 8GB Touch complete with all this missing functionality. Thankfully, the Nano's sound quality can still be held in high regard. And, once those notoriously poor supplied headphones have been exiled to the bin, you'll hear a slight improvement on the previous generation. Timing is excellent as always, but Eminem's Not Afraid sounds livelier, clearer and more expressive. The new Nano improves on the older model, then, but only in some respects.